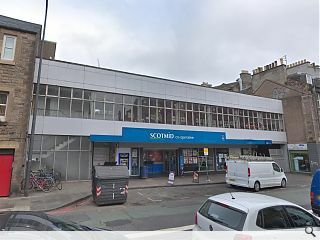 Scotmid Cooperative and Manson have extended their partnership with submission of plans to overhaul a store at Leven Street, Edinburgh, hot on the heels of plans for a sister store at Gorgie Road. 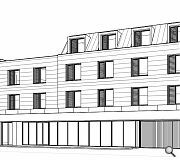 The mixed-use plans will create a 9,680sq/ft ground floor retail unit with a mix of eight flats above opposite the King’s Theatre. The chosen design response seeks to repair the street scene with a new sandstone clad building of between three and four storeys with a part-pitched mansard style roof housing two duplex flats. A projecting retail frontage at ground level will meet the street through curtain wall glazing and aluminium with a galvanized steel access gate protecting the current service access.